Modified Image via © lightsource. Affiliate links. Written by Betty G. Birney, the series follows the story of a likable hamster brought to room 26 by a substitute teacher. The temporary teacher first begins by explaining to the class that they can learn a lot about themselves by taking the opportunity to take care of another species. What is The Humphrey Book Series by Betty Birney ? The Humphrey series is an excellent book for children in the second to the fourth grades. It is a novel suitable for children of diverse ages. The Hamster narrates the story to the independent readers throughout the series. Unlike the substitute teacher, Mrs. Brisbane is not very enthusiastic about taking on a class pet upon her return to the school and is at first not aware of the tremendous impact that the hamster has had on the children, as well as the families where it has been spending the weekends. Humphrey, the Hamster, is able to bring out qualities such as kindness and courage to the different families he gets to visit while on the student rotation. During his weekend rotations, he is able to convince the members of one family to switch off the T.V and enjoy the company offered by each other. He also manages to encourage a very shy girl to speak up ad express her opinion, while also helping the principal regain control over his less than obedient children. Throughout the series, Humphrey is in a unique opportunity to observe the students in room 26, both at home and when in class, and is thus able to paint a very compelling picture of all the pupils. By spending time with each family, Humphrey gets to understand their problems and devise a way to help each child overcome the problems that he or she is facing. This in turn helps the child understand important life lessons. By reading this series to your young ones, you will be helping underscore the importance of knowing the entire story before rushing to make a conclusion. The presence of the hamster in room 26 makes a positive impact on the lives of all those present, including Mrs. Brisbane, the class teacher. What Issues are addressed in The Humphrey Book Series by Betty Birney ? Dealing with conflict and coming to resolutions. Would you like to see the writing house where Betty Birney does most of her writing? Visit her website here. She has a complete list of books she has written and information on how you can schedule a school visit. You can also contact her via e-mail at the bottom of each page using the contact me form. If your child wants to hand write a letter or draw a picture, Betty Birney asks that you scan it and send it in using e-mail! ACTIVITY IDEA: Write a letter to the author. Tell about the part of the story that you most connected with. Explain this connection. As a teacher and mom, I like to extend our reading experiences with a hands-on activity. These activity ideas are meant to inspire you to explore some of the book themes in further detail. Book activity extensions are often helpful for children when developing vocabulary and can lead to a greater understanding of the text. The World According to Humphrey Use a video recording device to make a short video book review. (Like the one above!) My kids use the video function on our camera and MovieMaker. Make an outline of the things you want to talk about. Get a friend or family member to assist if you can. Edit. Then, show your family when you’re done! 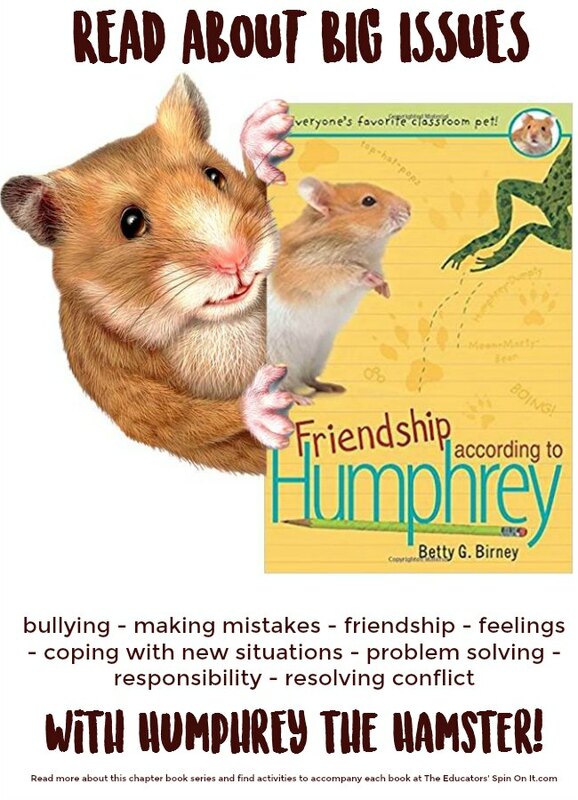 Friendship According to Humphrey Think about a time when you saw friends get sad or mad with each other. Brainstorm and write a list of ways they could solve the issue. Surprises According to Humphrey Put a surprise item in a paper bag. Don’t let anyone see what it is. Ask friends or family to guess what is inside by asking yes or no questions. Summer According to Humphrey Summer gets HOT! Cut out or draw a picture of Humphrey. Set it on a dark colored construction paper. Place it in a sunny area. You may want to hold your paper Humphrey down with a rock so he doesn’t blow away. Leave it for 2 or more hours. Remove and observe. School Days According to Humphrey Take a digital camera to your classroom and photograph where you sit, read, and learn. Make sure to get adult permission first. Get the pictures developed and make a school days book. Mysteries According to Humphrey Everyone loves a good mystery. Hide a toy and give a friend or family member clues to help them find it! Winter According to Humphrey Using white and blue construction paper – create a winterscape for Humphrey. Stamp snowflakes over the scene with que-tips or empty spools of thread for a snowstorm look. Secrets According to Humphrey Research hieroglyphics on the internet or check out a book from the library. Create a story on construction paper using hieroglyphics. Imagination According to Humphrey – Bring out the dress up box. Even big kids need the opportunity to use their imagination. No costumes? Let each child create a headband to represent an animal or character. Spring According to Humphrey Collect tadpoles from neighborhood creeks and ponds or order this grow a frog kit. From tails to tiny legs, then no tails, the transformation of frogs is life changing for kids to watch. Humphrey’s Book of FUN-FUN-FUN – Get inspired by all the fun. Use a large sheet of construction paper, a die, and a pencil to make your own Humphrey board game. Don’t forget to write the rules down. Play with a friend or family member when your board game is complete. Humphrey’s Ha Ha Joke Book – Practice your favorite jokes until you have them memorized. Then try them out on someone in your family! For Younger Students ages 5-8, Humphrey stars in Tiny Tales like, Humphreys School Fair Surprises – Set up a fair game, like bean bag toss, in your living room. Make and hand out prizes for the winners. Search all of the Tiny Tale Humphrey Adventures here. “As with all of Betty Birney’s Humphrey series books, this one is a huge hit! You have the same wonderful, caring hamster telling the story from his point of view. It’s now spring with Humphrey’s 2nd classroom of students. I love how the series teaches respect, consideration of others, good manners, doing the right thing, and problem solving in a setting that kids can understand and relate. I started reading this to my oldest when he was in 2nd grade although he could’ve read it himself. My kindergartener would listen until he fell asleep. Now I’m going through the series again for my youngest who is now in 3rd grade. Sometimes my older boys (now teenagers) will come in and listen as well. Super good memories being made with Humphrey!” ~ Mom of 3 Boys on an Amazon Review. Travel Through Time with the Popular Magic Tree House Chapter Book Series and 54 ACTIVITES! My daughter is just learning to read and as of yet is not the keen reader I´d like her to be so I´m always on the lookout for books that might engage her and this seems a good choice although maybe they are above her age/level at the moment. What is the level equivalent in Britain/Europe of Grade 2-5?